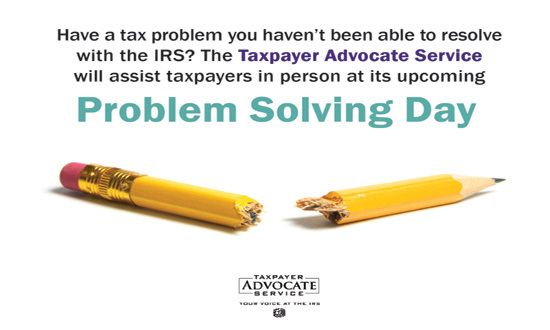 The Taxpayer Advocate Service (TAS) will conduct Problem Solving Day events in communities throughout the country in the coming months and year. During these events, TAS employees from a local office will be available to assist taxpayers in person with tax problems they have not been able to resolve with the IRS. Generally, TAS can assist taxpayers whose problems with the IRS are causing financial difficulties, who’ve tried but haven’t been able to resolve their problems with the IRS, or believe an IRS system or procedure isn’t working as it should. And our service is free. Why is TAS holding Problem Solving Days? Congress created the Office of the National Taxpayer Advocate as we know it today through the IRS Restructuring and Reform Act of 1998 (RRA 98). The law further strengthened the role of TAS and provided for Local Taxpayer Advocates in each state. TAS maintains a geographic presence in each state, the District of Columbia, and Puerto Rico, and continues to look at changing taxpayer demographics to adjust its footprint to meet taxpayer needs. Recognizing the importance of personal contact, we work one-on-one with taxpayers and their representatives within our area to resolve their tax issues. As the IRS develops its “Future State” plan that focuses on assisting taxpayers digitally rather than in person, the National Taxpayer Advocate continues to elevate her concerns about the plan through her Reports to Congress. Ms. Olson conducted twelve public forums in 2016 to hear from taxpayers throughout the country on their needs and preferences when dealing with the IRS. A consistent concern raised during the forums was IRS’s continuing trend away from person-to-person and face-to-face taxpayer service and compli­ance activities, including audit, collection, and appeals, as well as a declining geographic IRS presence and increased centralization. The National Taxpayer Advocate included her findings in her 2016 Annual Report to Congress Special Focus which discussed her vision for a taxpayer-centric 21st century tax administration. We are Your Voice at the IRS. Look for a Problem Solving Day event in your community from the list below. Otherwise, you can contact your local TAS office by visiting www.TaxpayerAdvocate.irs.gov/contact-us. Michael Smeriglio is a financial specialist. A licensed CPA since 1985, Mike has been providing tax preparation services to individuals and businesses for more than 30 years through his firm located in Greenwich, CT.